Saint-Gobain UK and Ireland, part of the Saint-Gobain Group, the world leader in the Habitat and Construction markets, has released its Corporate Social Responsibility Review 2018. Saint-Gobain’s UK & Ireland’s progress in response to industry challenges is highlighted in the Review and focuses on its commitments which include creating better buildings, caring for the environment, connecting with communities and developing our people. Some of the achievements documented in the Review include; 94.2% of electricity use is now renewable only, the launch of a national plasterboard recycling scheme in Ireland and 4,655 students trained in construction skills to help tackle the industry skills gap. We also saw a further decline of 9% in the amount of waste our business sent to landfill, reducing for the fourth consecutive year and launched closed-loop glass recycling pilots and waste collection schemes designed to bring closed-loop principles to other construction waste streams. Saint-Gobain has also reported progress in supply chain activities with a focus on Modern Day Slavery training, collaboration with charity Stronger Together, a focus on helping suppliers to the business in their own CSR development and a further business being awarded BES 6001 Responsible Sourcing Certification. There were also some positive statistics for employees with the ‘health age’ of the organisation reducing by 2,788 years and the launch of the ‘It’s OK not to be OK’ mental health programme. 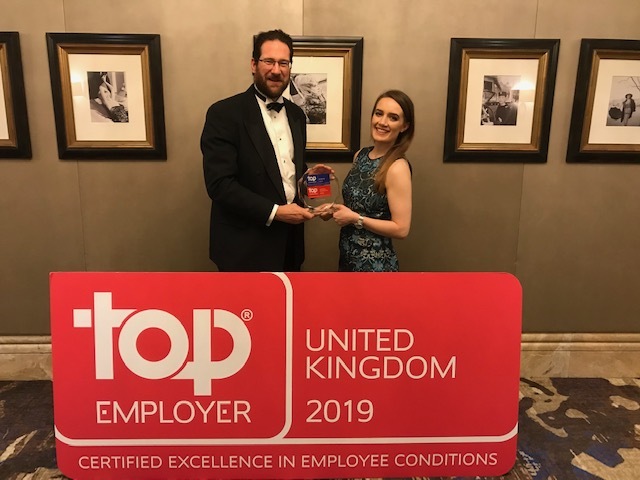 Saint-Gobain was also recognised externally with Top Employer status for the fifth year in the UK and the second in Ireland. This Review presents the annual performance data for all of our UK and Ireland businesses for the calendar periods 2016 and 2017. The full Review, and previous snapshots, can be viewed in our CSR section.